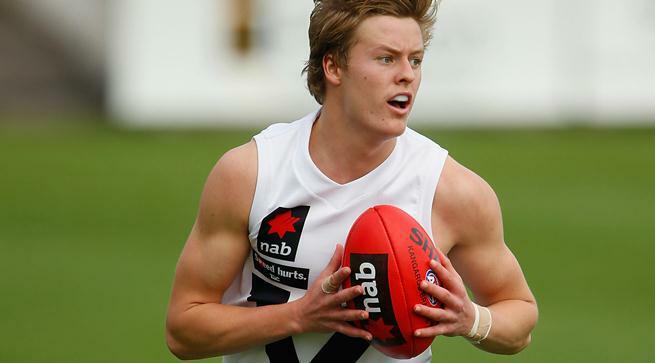 Vic Country has won its first interstate game of the 2014 NAB AFL U18 Championships with a convincing 64-point win over WA in their Round 4 clash last weekend. Country got off to a flying start and could have been further ahead with more accurate kicking after slotting through 4 goals 6 behinds to WA’s 1 point in the first term. Dandenong Stingrays captain Jack Lonie made his presence felt in the second quarter, kicking two goals while Jordan Cunico (Gippsland Power) racked up the possessions with 10 disposals for the term (18 for the half). Cunico was dominating, but left the field early in the third term with a broken nose and took no further part in the game. Country’s team work and defensive pressure shone in the third team, keeping WA goalless while finding multiple avenues to goal up the other end. Nick Dixon (Geelong Flacons) lifted his output in the second half and along with North Ballarat Rebels pair Daniel Butler and Darcy Tucker, and Billy Evans (Bendigo Pioneers) had a real influence on the match. While Dixon finished with a game high 28 disposals and 6 marks, it was Lonie that was best on ground. Along with 4 goals the small forward had 24 disposals and 3 marks. Tucker (23), Evans (21), Murray Bushranger Daniel Howe (21) and Geelong Falcon Darcy Parish (21) all had big numbers, but it was the even contribution from every player on the ground that allowed Country to dominate from start to finish and secure the win. Vic Country will now take on SA at Simonds Stadium in Round 5 of the NAB AFL U18 Championships, in what may just be the championship decider on the 27th June. Their final game of the championship will be against WA on the 2nd of July at Etihad Stadium.